Earlier this year, researchers came together to investigate the health and habits of killer whales using a custom-built, remotely operated hexacopter. The study, which resulted not only in incredible footage but fascinating observations, is the first to incorporate a drone in the monitoring of killer whales. The study was a collaboration between Lance Barrett-Lennard, of the Vancouver Aquarium Marine Mammal Research Program, and researchers John Durban, Holly Fearnbach, and Warne Perryman of NOAA. Together with their trusty hexacopter (which they named "Mobly"), and Don Leroi of Aerial Imaging Solutions, the team set out in August to monitor the health of whale populations from overhead. It turns out a malnourished killer whale can look perfectly healthy when viewed from the side, and a whale that is visibly malnourished in profile rarely recovers. Previous research, conducted from helicopters, has shown that measuring the width-to-length ratio of killer whales from above can not only distinguish healthy whales from sickly ones, but do so before the whales become moribund. 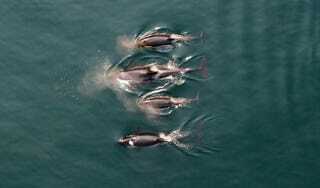 Past findings had also shown that monitoring whales from the air could reveal which whales were pregnant. But helicopters are noisy and disruptive to the whales. Even if a research team could afford one (helicopters are expensive – and we all know how filthy rich scientists are), the helicopter would have to be operated high above the water, making it it difficult to acquire quality images of the whales. From our first flight over killer whales on August 14, Mobly proved his worth. Launched from the cabin roof of the Skana and ably piloted by John, it climbed quickly to 30 metres. Holly watched Mobly's live video feed, directing John until the hexacopter was perfectly positioned over the whales. Wayne and Don ensured that Mobly was properly programmed and in good working order. My role was easy: find the whales, pilot theSkana and make sure that we kept to the terms of our extensive set of research and flight permits. That first day was memorable not only for images of whales, but for the amount of high-fiving that took place. Mobly performed like a dream—steady, stable, and quiet. The images of the whales were stunning, and revealed right away that we weren't going to have difficulty distinguishing robust and thin whales. We could readily identify individuals based on scratches and scars on theirs saddle patches, which were easier to see from above than I expected, and we could positively identify pregnant females. Most importantly, the whales didn't react to Mobly visibly; not only did they not appear disturbed, they didn't seem to notice him at all. The use of aerial drones in scientific research is a hot subject right now. This summer, America's Federal Aviation Administration published rules that that prohibit commercial uses of drone, which includes research and teaching at private universities. More information on the first-ever UAV observation of killer whales (and many more pictures!) at the Vancouver Aquarium's AquaBlog.